Chess champion of the world from 1866 to 1894; born at Prague, Bohemia, May 17, 1836; died, insane, on Wards Island, New York, June 22, 1900. 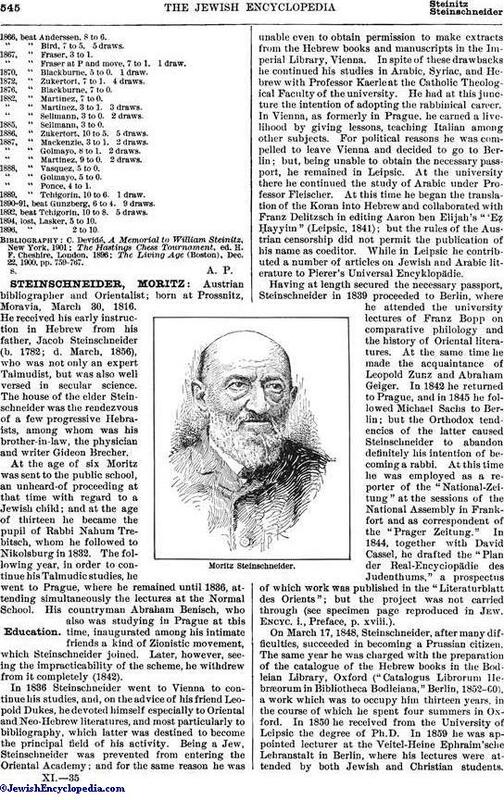 Destined for the rabbinate, he studied Talmud diligently, but his fondness for mathematics overcame his parents' wishes, and he continued his education at the Polytechnic Institute, Vienna. When a student he was troubled with much bodily infirmity, which accompanied him through life. At one time he was on the staff of a Vienna newspaper, but was obliged to relinquish his position owing to defective eyesight. Steinitz learned the moves of chess when he was twelve years old. Being unable to afford a proper board and set of men, he crudely carved some pieces from kindling-wood; and a painted square of linen did duty for a board. He applied himself to the game with such earnestness that he soon beat his professor and came to be regarded as an expert by the leading players of Prague. In 1858, while in Vienna, he secured an introduction to the Chess Club of that city, and soon became known as a strong and brilliant player. In the club tournament, of 1861 he won the first prize, losing only one game out of thirty-four played. Then he devoted himself wholly to chess, his principal patron being Epstein, the banker. 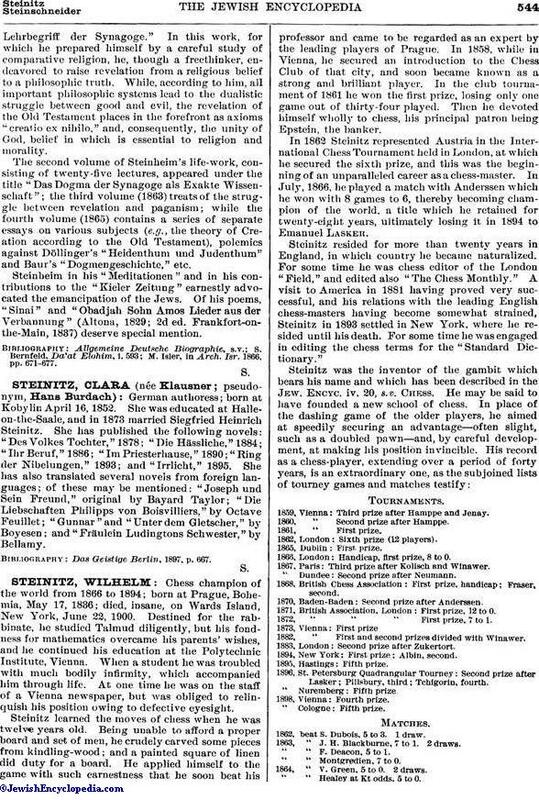 In 1862 Steinitz represented Austria in the International Chess Tournament held in London, at which he secured the sixth prize, and this was the beginning of an unparalleled career as a chess-master. In July, 1866, he played a match with Anderssen which he won with 8 games to 6, thereby becoming champion of the world, a title which he retained for twenty-eight years, ultimately losing it in 1894 to Emanuel Lasker. Steinitz resided for more than twenty years in England, in which country he became naturalized. For some time he was chess editor of the London "Field," and edited also "The Chess Monthly." A visit to America in 1881 having proved very successful, and his relations with the leading English chess-masters having become somewhat strained, Steinitz in 1893 settled in New York, where he resided until his death. For some time he was engaged in editing the chess terms for the "Standard Dictionary." 1859, Vienna: Third prize after Hamppe and Jenay. 1860, " Second prize after Hamppe. 1862, London: Sixth prize (12, players). 1866, London: Handicap, first prize, 8 to 0. 1867, Paris: Third prize after Kolisch and Winawer.
" Dundee: Second prize after Neumann. 1868, British Chess Association: First prize, handicap; Fraser, second. 1870, Baden-Baden: Second prize after Anderssen. 1871, British Association, London: First prize, 12 to 0. 1872, " " " First prize, 7 to 1. 1882, " First and second prizes divided with Winawer. 1883, London: Second prize after Zukertort. 1894, New York: First prize: Albin, second. 1896, St. Petersburg Quadrangular Tourney: Second prize after Lasker; Pillsbury, third; Tchigorin, fourth. 1862, beat S. Dubois, 5 to 3. 1 draw. 1863, " J. H. Blackburne, 7 to 1. 2 draws.
" " F. Deacon, 5 to 1.
" " Montgredien, 7 to 0. 1864, " V. Green, 5 to 0. 2 draws.
" " Healey at Kt odds, 5 to 0. 1866, " Anderssen, 8 to 6.
" " Bird, 7 to 5. 5 draws. 1867, " Fraser, 3 to 1.
" " Fraser at P and move, 7 to 1. 1 draw. 1870, " Blackburne, 5 to 0. 1 draw. 1872, " Zukertort, 7 to 1. 4 draws. 1876, " Blackburne, 7, to 0. 1882, " Martinez, 7 to 0.
" " Martinez, 3 to 1. 3 draws.
" " Sellmann, 3 to 0. 2 draws. 1885, " Sellmann, 3 to 0. 1886, " Zukertort, 10 to 5. 5 draws. 1887, " Mackenzie, 3 to 1. 2 draws.
" " Golmayo, 8 to 1. 2 draws.
" " Martinez, 9 to 0. 2 draws. 1888, " Vasquez, 5 to 0.
" " Golmayo. 5 to 0.
" " Ponce, 4 to 1. 1889, " Tchigorin, 10 to 6. 1 draw. 1890-91, beat Gunzberg, 6 to 4. 9 draws. 1892, beat Tchigorin, 10 to 8. 5 draws. 1894, lost, Lasker, 5 to 10. 1896, " " 2 to 10. The Living Age (Boston), Dec. 22, 1900, pp. 759-767.